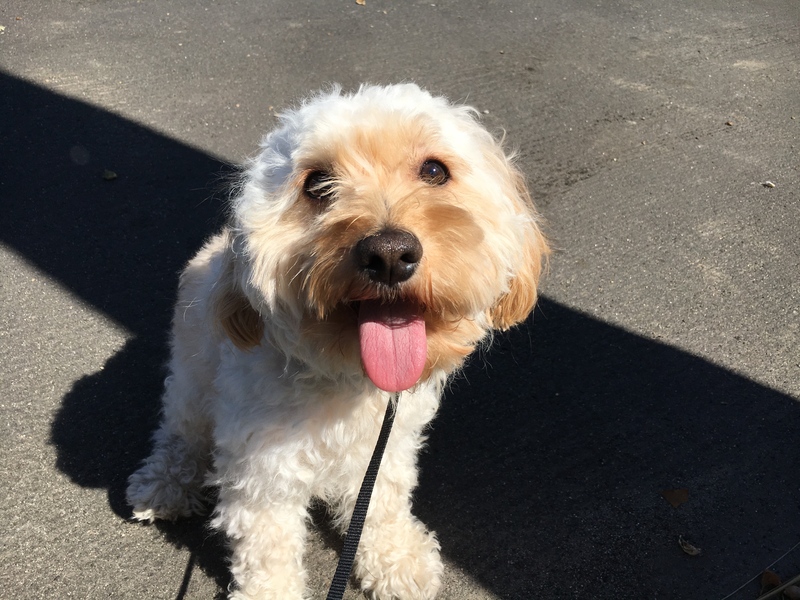 Leo is a three-year-old Cockapoo who lives in the Mar Vista section of Los Angeles. His guardians set up a dog behavior modification appointment with me to address his fearful aggression; barking at, nipping, charging and jumping up on anyone who does anything he disagrees with. His guardians reported that he is most reactive to unknown men. When I arrived at his home, I found a very upset Cockapoo who was barking to make it crystal clear I was not welcome in his home. I say “his home” because to Leo, there was no doubt. This was his home and he was the top dog, well in his mind. He had no rules or boundaries to respect. While some dogs can be fine with that lack of structure, other dogs interpret it as the human’s needing someone to take over. This was even more pronounced with Leo due to his guardians petting him when he was upset or reactive. This is a common mistake I see many people make. Because we pick up and try to soothe a crying baby, many humans adopt the same approach with their dogs. But if you have a dog who is acting aggressively and you pet it, the dog interprets that its being petted because they are being aggressive. To stop dog barking, I pulled out a leash and had one of his guardians attach it to his collar. When I reached for it, Leo started barking like crazy until I put it on the floor and stepped on it a foot from his head. As soon as I stepped on the leash, the dog stopped barking and transitioned into a low almost constant growl for a minute or two while I discussed the situation with his guardians. I did not look at, try to pet or talk to Leo. All I wanted him to learn was that just because you are near a human, nothing bad is gong to happen. Many people think petting a dog is the best way to become friends. But for a fearful or territorial dog, this type of interaction only makes the dog more reactive. After a few minutes, Leo laid down and relaxed on the floor at my feet. I doubt anyone else had ever confronted him in such a soft and non reactive way. I wasn’t gong to back down, but I also wasn’t going to do anything that would cause him distress. I learned that Leo was particularly aggressive to the family’s females. He had nipped the mother multiple times, same thing for his guardian and her sister. He would even growl at the family’s father if he dared stop petting him. If anyone was sleeping on the couch and Leo was there, he would growl if the person moved or got up. Because of his behavior and all the dog barking, I suggested that the guardians start adding in some rules; the first one being not being allowed on the furniture. For dogs, the higher they sit, the more rank they have. Since he was being so aggressive in that location, Leo should not be allowed on the furniture until his behavior changes considerably. Likely a few months. I suggested the guardians start practicing my Petting with a Purpose method which involves asking the dog to sit or lay down before petting it and NEVER petting it when its in an unbalanced state of mind. This helps the dog transition into a follower’s mindset which will allow Leo to let loose much of the stress and anxiety that has turned into frustration and his acting like an aggressive dog. By constantly enforcing rules, boundaries and limits, petting with a purpose and taking him out for daily walks, Leo should stop acting so aggressively to his family members. In fact, near the end of the session, I guided the family’s mother through a walk with Leo. At the end of the walk, she was able to not only pet Leo (a first), but was able to pick him up (another first) and carry him into the house then continue petting him. I love how quickly dogs adopt new behaviors. Now minutes later, angry dog Leo came out again once the petting stopped, so this will be a process. But going from an “I will bite you” conversation to sitting on my lap while I made the Roadmap to Success video at the end of the session tells me that Leo can change. Its going to be up to his humans to help him by taking the leadership role via enforcing rules and providing him structure. You can watch Leo’s Roadmap to Success video in the video below.